Since we began operations over a year and a half ago, Artemis Art Â has made one thing quite clear: that we would be a platform to promote freedom of expression through art. And we’re very proud to say that we’ve managed to keep true to our mission in this regard. On September 16, 2013 Malaysia turns 50. Half a century gone by, and it got us wondering: what do young Malaysians think of Malaysia?Â It is a simple question, but perhaps one that we have taken for granted. 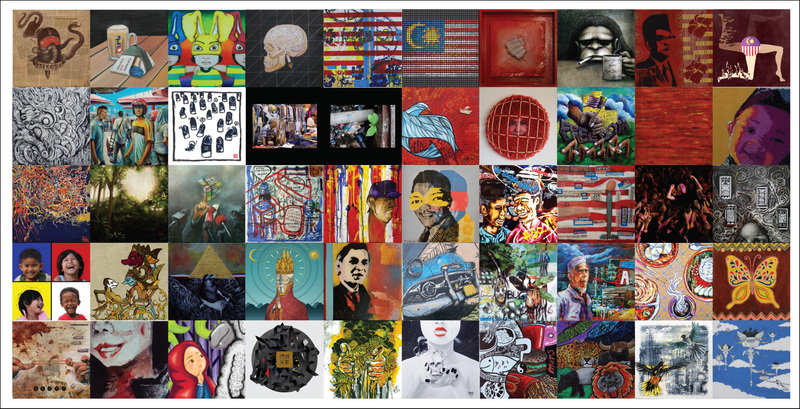 The 50 Shades of Malaysia project and exhibition is Artemis Artâ€™s contribution to the larger M50 Selamat Hari Malaysia project, an initiative by Balai Seni Visual Negara, and coordinated by [email protected], to celebrate Malaysiaâ€™s 50th Anniversary on 16th September 2013. Our aim is to explore the subject of nationhood through the eyes of young artists, each of whom providing his or her own unique perspective of what strikes them when they think about our nation, Malaysia. Whether it is a celebration of our cultural and natural heritage, our history, current issues, or anything else uniquely Malaysian, this project provides insights as to how the younger generation see themselves as citizens of this great nation. The question we asked the participating artists was simple: How do you feel about Malaysia? What we got back was 50 varied viewpoints, a superb mix of different emotions, thoughts, ideals, visionsâ€¦ in short, a diversity mirroring that of our own nation. 50 Shades of Malaysia will go on display beginning August 27, 2013 at the Boulevard Area (Level G2), Publika Shopping Gallery, Solaris Dutamas, and will continue its run until September 17, 2013. In conjunction with this project and exhibition, we are in the process of publishing a 108-page catalog, which will be available for sale. Most of the artworks on display will be for sale as well. To help promote 50 Shades of Malaysia, and of course the young artists who are participating, Artemis Art encourages social media users to use the official hashtagÂ #50SoM whenever referring to the exhibition on Facebook, Instagram or Twitter. As most of these young artists may not be familiar names, we have included in the catalog a short curatorial introduction for each of them, complementing the statements written by the artists themselves about their works. We believe that the future of this nation lies with the youth, and it is important that their ideas and aspirations are shared with all. It is our hope that this project and exhibition will enable these young talents to reach out to a wider audience, and at the same time create a heightened appreciation for their works, and for art in general. We hope, too, that in the process of creating these art works and writing the accompanying statements, it has taken the artists through a soul-searching process. In presenting their feelings and thoughts through their beautiful art works, it also our hope that this project has allowed them to find reasons to be proud of being Malaysian, whatever the political and economical climate we may be in today. Malaysia is indeed a unique and beautiful country. We, the citizens of this nation, made up of people from different religions, cultures and beliefs, have for these 50 years lived peacefully and harmoniously. It is this diversity that makes us unique, as one nation. May we be blessed with many more centuries of such harmony and peace.